Side 1 printed with four-color process. Side 2 printed with 1 PMS color. 100lb White Smooth stock uncoated. Black Velcro closures. 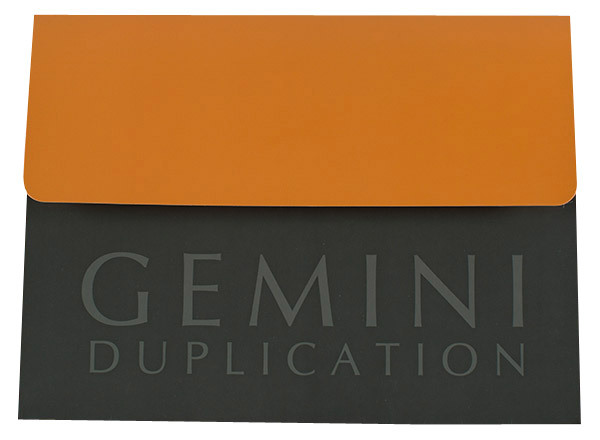 A forest green front panel gives Gemini Duplication a slightly dark, organic appearance. The orange flap leads to the rest of the design—it's the same color as the interior and sides. Associated with energy and youth, orange also hints at efficiency and safety for the companies that use the firm's online records management and workers' compensation technology. Fluffy clouds float across the back panel, suggesting that the sky's the limit when it comes to workplace safety. Side 1 printed with four-color process. Side 2 printed with 1 PMS color. 130lb C2S Silk stock (currently unavailable) coated with Aqueous Satin. This promotional packet for Sony Pictures' 2010 "Salt" takes the movie's spy theme to new heights. Recipients who begin to open the flap receive the warning that the pocket's contents are classified, making them feel like they have a key role in the film's production. 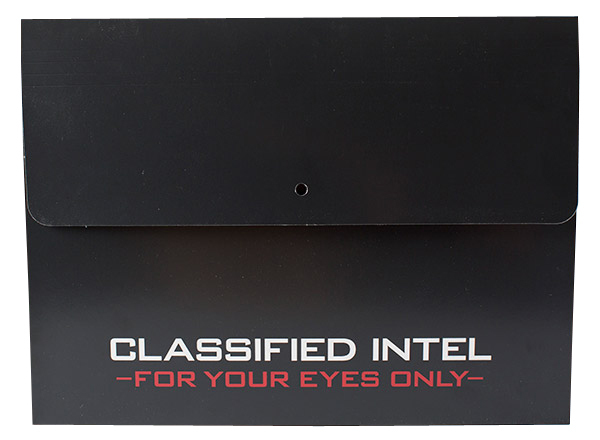 The reverse side likewise blares that its contents are top secret, adding a security level and an agent's name under an official-looking to seal make the experience believable. The overall effect is one of suspense, intrigue, and self-importance for the person receiving the packet. Side 1 printed with 2 PMS colors using heavy coverage. 14pt C1S White Semi-Gloss stock coated with Aqueous Gloss. H1 business card slits on flap in left position. 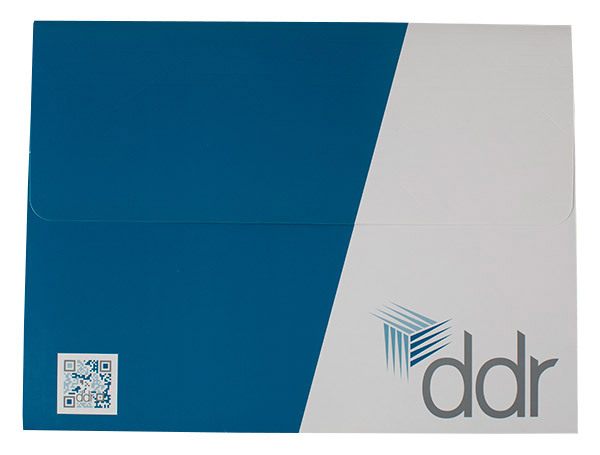 A modest blue and white color scheme presents a put-together image for real estate investment trust DDR. The two colors slant diagonally to suggest innovation and motion, while the back panel features the brand's slogan and logo in light blue to add visual intrigue. A colorful QR code is the only contact information. This lets the rest of the design retain its streamlined look and emphasizes the brand's name and logo. A white Velcro fastener locks the flap in place. The pocket's near-total coverage is only interrupted by the curved hand hold, which allows easy access when retrieving papers. Four-color process printed on Side 1 of 14pt C1S Semi-Gloss stock. Coated with High Gloss UV. Velcro® fasteners. 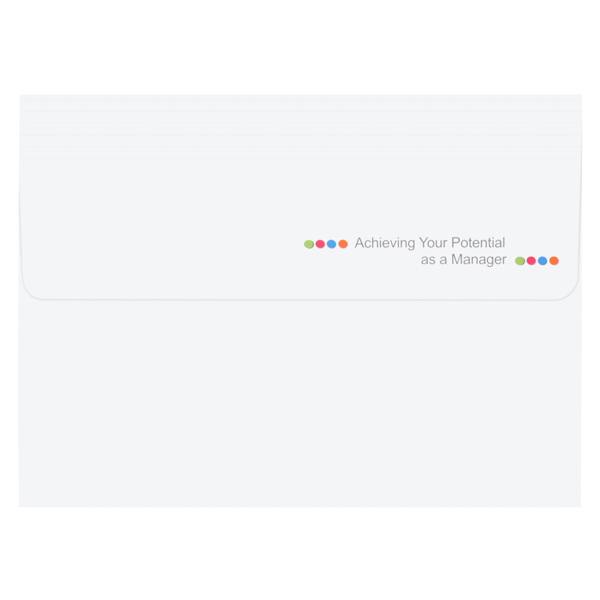 Experian presents its manager training materials in this refreshingly minimal design. Glossy white panels allude to organization and attention to detail, while dots of color punctuate the design with a fun, youthful look. Magenta and blue ink emphasize the typography with a bright, cheerful color scheme. Perfect for large presentation packets or stacks of print materials sized 11” x 8 1/2", this landscape-oriented product looks sleek and modern. Its sealed gusset allows the pocket to carry stacks of documents up to 1 1/2" thick without exposing their bottom corners. For extra security, add Velcro® or elastic band closures to fasten the 3" flap. The outer panels offer ample room for design elements, from a stylized logo to full-color images to informational text.